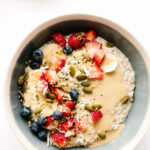 This vegan 5-minute creamy bircher muesli comes together in a flash making it perfect for on-the-go mornings and busy weekdays. On top of its swiftness, this muesli is also super versatile, so feel free to mixup the add-ins and toppings to suit your breakfast fancy. Traditional bircher muesli is essentially the same thing as overnight oats. Rolled oats, milk, seeds, dried fruit, etc. are tossed together in the evening and left to thicken to creamy perfection until morning. 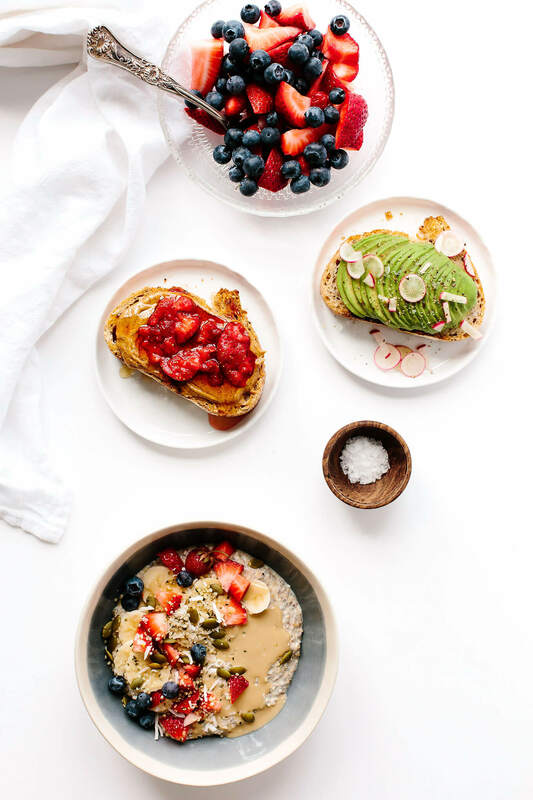 Now, I love overnight oats as much as the next gal, but I often remember to make overnight oats in the morning instead of at night. Not exactly helpful timing, so I often end up whipping up hot oats instead. 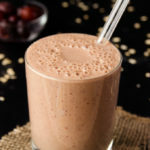 With the warmer weather moving in, I’ve been looking for a cooler, instant breakfast to satisfy my nearly constant oat cravings. So when I saw deliciously ella’s instant bircher muesli a couple weeks back, I immediately whipped up a batch. And my goodness, did it satisfy. 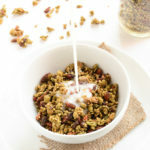 I’ve been toying and fine tuning the recipe to suit my tastes (i.e., adding ground flaxseed, tahini, and ground warming spices to a variation of the original recipe), and figured I might as well share my (mild) adjustments and favorite toppings with you here. 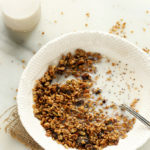 If a thinner muesli is desired, whisk in a bit more plant-based milk until desired consistency is reached. 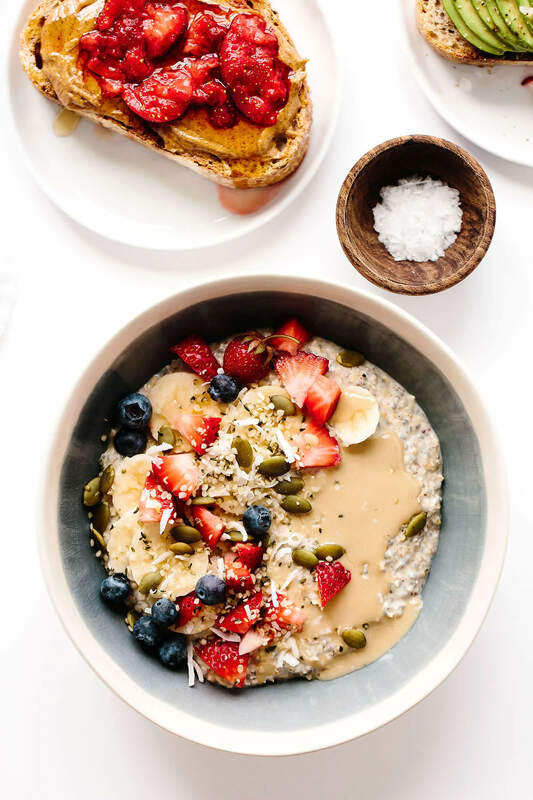 Then, spoon the bircher muesli into a bowl and top with sliced bananas, strawberries and/or blueberries, pepitas, shelled hemp seeds, a drizzle of tahini, and a bit of flaked coconut. Keep in mind that if you’re washing and slicing the berries the day of, this recipe will take a bit longer to prepare than 5 minutes. However, I like to prep the berries ahead of time so that I can simply whisk, top, and enjoy. 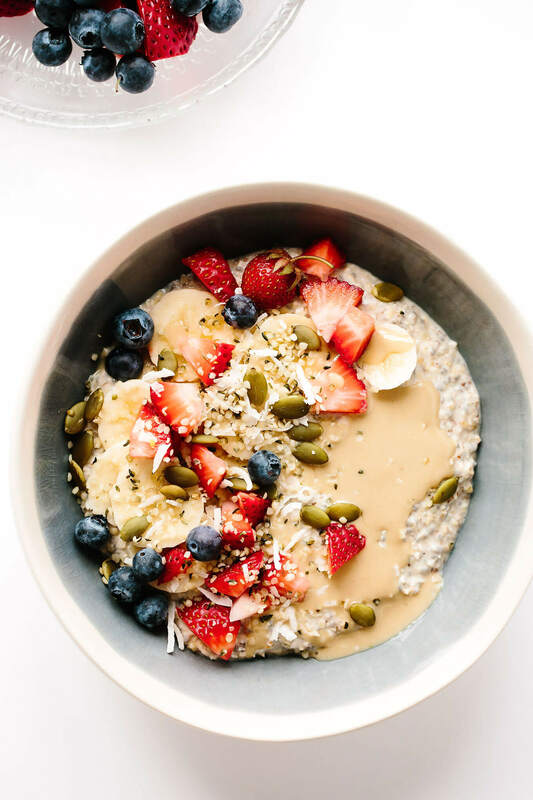 This vegan bircher muesli packs a surprising punch of plant-based protein, thanks to the oats, seeds, and tahini. Depending on how generous you are with toppings and add-ins, I would venture to guess a bowl contains anywhere from 15g to 25g of plant-powered protein. It also offers oodles of fiber, and a little extra fiber is always a good thing in my book. 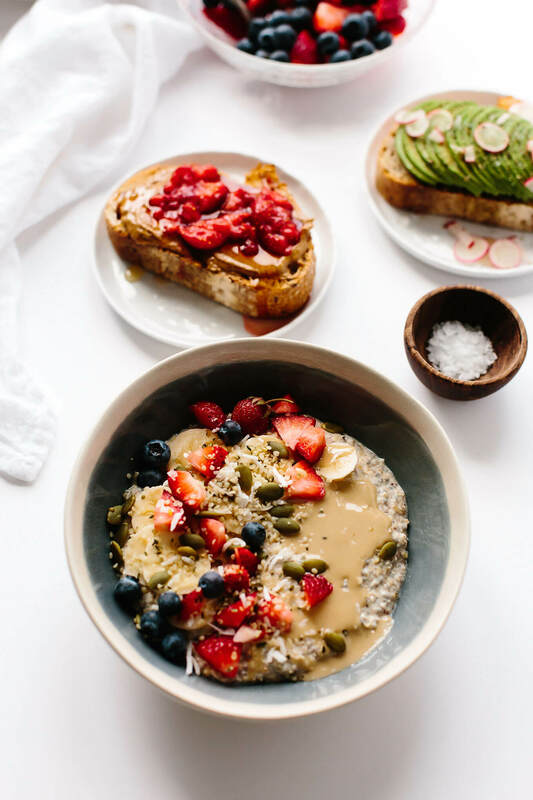 This vegan 5-minute creamy bircher muesli comes together in a flash making it perfect for on-the-go mornings and busy weekdays. 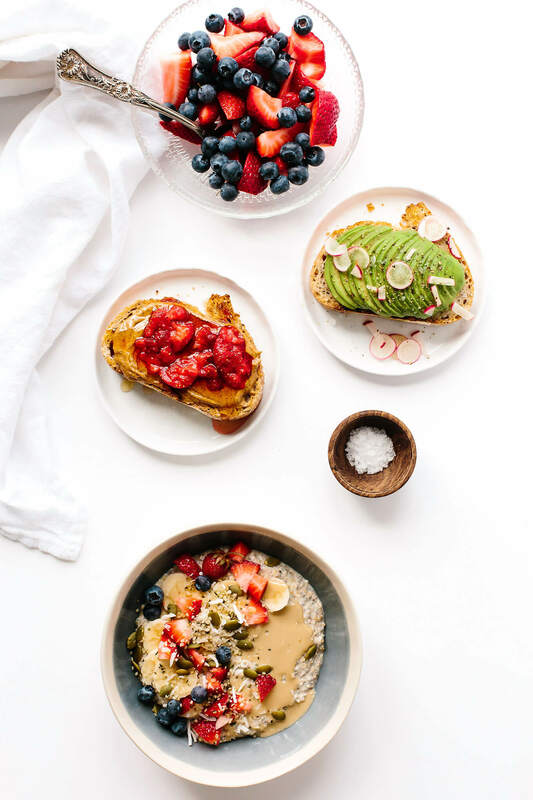 On top of its swiftness, this muesli is also super versatile, so feel free to mixup the add-ins and toppings to suit your breakfast fancy. Recipe adapted from the lovely Deliciously Ella. Top with the banana, strawberries, tahini, pepitas, hemp seeds, and coconut flakes. Serve immediately. 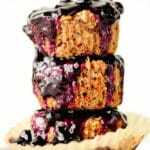 Healthy and tasty looking breakfast or snack! What kind of substitute milk are you using? Thanks, Ben! I use unsweetened almond milk. This looks delightful. :) Have you tried doing it the old-fashioned bircher way, soaked overnight? Thanks, Aidan! Not this particular recipe, but in general, yes. I have several recipes for overnight oats on the site if you’re interested. Enjoy!